The discovery, at McGill University, of two hundred rolls of plans (15 000 in all) that had been willed to the university, along with drawings, ledgers, diaries and sketches, by Edward Maxwell's wife, marked the beginning of my interest into the work of Edward and William Sutherland Maxwell. Professor John Bland, the honourary curator of the University's Canadian Architecture Collection (CAC), received favourably my request: to study these documents and possibly to publish something of interest to fellow architects and historians. After my work on nineteenth-century villas around Quebec, it seemed interesting to research country houses built in the Montreal area at the turn of the century, and thus advance an understanding of this type of architecture. From the autumn of 1981 to mid 1982, I made a complete inventory of the Edward and W.S. Maxwell Archives. I sifted through this material in search of country house plans, an endeavour which produced eighty buildings for my study. In 1982, I located the houses around Montreal, in the Laurentians and in New Brunswick, redrawing some of the plans with the help of architect George W. Leahy. At this time, I met with the owners and photographed all the houses, including some interiors, details of construction, pieces of interesting furniture, and gardens. This documentary work was conducted with the help of photographer Brigitte Ostiguy. The study of country houses designed by the Maxwell brothers, together with the studies of a multidisciplinary group of Montreal scholars, helped us understand a larger body of their architecture. This ensemble of work was exhibited in a number of Canadian museums as part of the 1991 travelling exhibition. If the Maxwell architecture now seems classical, it was very innovative during its time and made a major contribution to the evolution of Montreal's own style. Once established, this style was to extend its influence all across Canada in buildings erected in connection with the construction of the Canadian Pacific Railways. 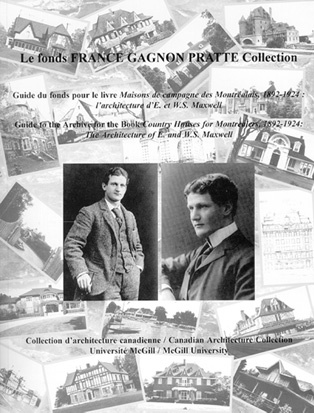 The photographs collected for the book Country Houses for Montrealers, 1892-1924: The Architecture of Edward and W.S. Maxwell add to the study of these architects, especially since some of the country houses have now been demolished or have survived through many unfortunate renovations. These photographs are a very pertinent extension to the study of Maxwell architecture. It is with the intention of encouraging future research and scholarship that I donated the archive in 1994 to the Canadian Architecture Collection at McGill University.